In the story of David and Goliath, David announces to Goliath “You come to me with a sword, a spear and a javelin. But I come to you in the name Adonai Tzava’ot, the G-d of the armies of Yis’rael, whom you have challenged. 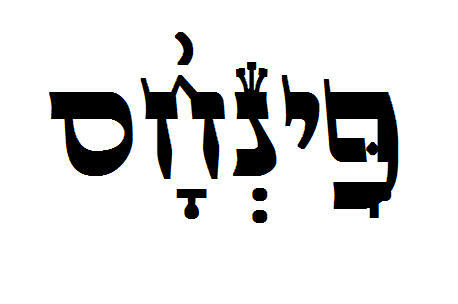 Today Adonai will hand you over to me. I will attack you, cut off your head, and give the carcasses of the army of the Philistines to the birds of the air and the animals in the land. Then all the land will know that there is a G-d in Yis’rael, and everyone assembled here will know that Adonai does not save by sword or spear. For this is Adonai’s battle, and he will hand you over to us.” Such was David’s zeal and faith for G-d.
Pinchas displayed this same zeal and received the highest commendation from HaShem. Why does the Torah find the zeal of Pinchas so commendable? Is it not cause for concern that this example of taking justice into one’s own hands might be abused? According to tractate Sanhedrin 82a in the Talmud, the early sages believed that Zimri brought Kozbi into the camp of Yis’rael to challenge Moshe, who himself was married to a Midianite woman. Rashi points out that Moshe married Zipporah before the Torah was given. But at the time of giving the Torah at Sinai all Yis’rael, including the foreigners amongst them, underwent a mass conversion. Zipporah was no longer a heathen. Pinchas was in the lineage for the Cohen Gadol (High Priest), he was the grandson of A’haron. Pinchas SAW what was happening; Yis’rael was being violated. Not just by sexual immorality but by idolatry. G-d had ordered all the chiefs of each clan to be hung, facing the sun because of Yis’rael’s idolatry. Right in the middle of all this, Zimri brought this Midianite woman and in full view of the entire nation, took her into his tent. Pinchas, full of zeal for G-d and righteous anger, went in to the tent and dispensed justice. Melekh David wrote in Psalm 69: 9, “Zeal for Your house has consumed me.” Yochanan, in chapter 2, quotes these words when Yeshua cleared out the moneychangers from the Temple courts. So what does it mean to be zealous? The root of the word Zealous (Kana’ir in the Hebrew) means, in its mildest sense, keen, enthusiastic. It can also mean filled with, or inspired by, intense enthusiasm or zeal; ardent; fervent. At its extreme it can mean fanatical, obsessed. And the opposite to all these can be apathetic, indifferent, lethargic, unenthusiastic. In the days of Yeshua, there were groups of people who were against the occupation of the Romans. They refused to pay Tribune (taxes) etc. These were called Zealots. But some took it to the extreme and organised themselves into fighting groups who carried out assassinations and other violent activities to rid themselves of the Romans. One of Yeshua’s talmidim was known as Shim’on the ‘Zealot’, probably a reference to his previous activities. However, the zeal for G-d that we ought to have is that of enthusiasm & earnestness. It means to love the L-rd with ALL your heart and soul and strength. Then our love for the L-rd will consume us. It’s like someone who plays the piano or other musical instrument for fun; they can be enthusiastic in their playing. But someone who is a serious musician can spend all their time and their life perfecting their sound etc. It can be consuming; they have a fire burning within them, a passion, a zeal. I pray that our love and zeal for G-d consume each one of us and we can spread the passion we have to others.